I'm back to Bacolod, the City of Smiles, and this time I'm with two more friends, Ezra and Rizza. We got the tickets for Php 1,500.00 last September 2013 when Tiger Air launched their airline here in the Philippines. It's my first time to ride Tiger Air for a local trip and it wasn't good experience. Aside from the delay, we had to transfer to Terminal 3 from Terminal 4 and ride Cebu Pacific because of some "operation failure". It was a 5:55AM trip but we ended up booking on the 7:15AM flight of Cebu Pacific which was also delayed. We boarded at around 8AM and snoozed our way to Bacolod. We landed past 9AM and rode the shuttle vans to Bacolod City (Php 150 each). 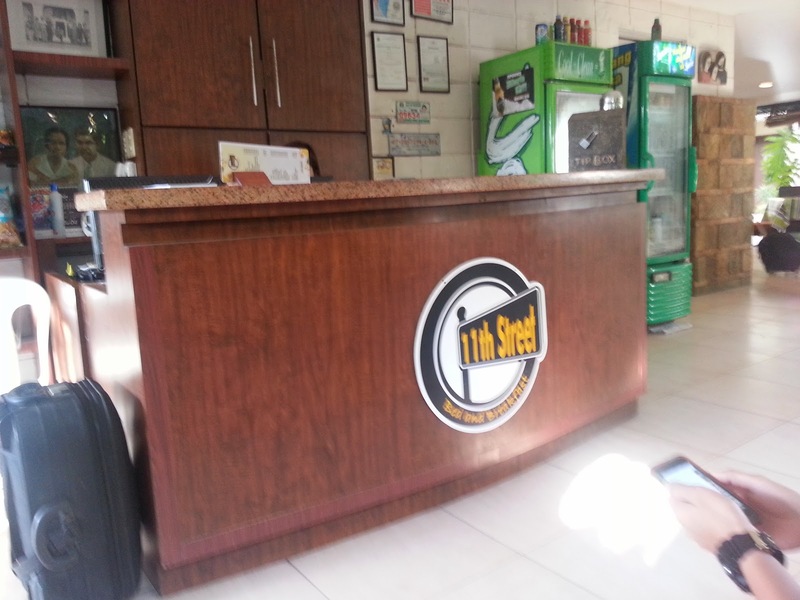 Just like our my last trip, we booked at 11th Street Bed and Breakfast for our lodging in Bacolod. It's really a different thing when you eat Inasal in Bacolod. All the bad vibes from the delayed flight was suddenly gone! Haha. We ate until we're so full and yet our bill just went for Php 600. After lunch, we dropped by the SM Tourist Center to buy Ocean Jet tickets for our trip to Iloilo. From there we rode a jeep to North Terminal and then a Ceres Bus to Silay City. We stopped by the Silay Public Plaza, between Zulueta and Rizal St, from our bus ride. From here we started walking our walking tour. Silay City houses some of the iconic heritage mansions in our country. Since Negros produces Sugar, Silay City became the home of the wealthy hacienderos and some political leaders. It is the only pro-cathedral outside of the national capital of Manila, and is unique in Negros Occidental for being the only church in the province featuring acupola or dome. Cinco De Noviembre means 5th of November. It now considered as Negros Day because in November 5 of 1898, the Negrense cleverly revolted against Spanish Colonial. The street and this monument was created to commemorate this special day. Balay Negrense, or Negrense House in English, is the ancestral house of Victor F. Gaston, whose family is considered as one of the pioneers in sugarcane cultivation in Negros. It was turned into a museum during the 90s after it was abandoned during the 70s. Entrance to the museum is Php 50.00 for adults. They also have a gift shop inside where you can buy great souvenirs. We're supposed to visit more mansions but my friends are a bit tired (because of our flight delay) so we had to settle with just visiting Balay Negrense and rest a bit at El Ideal. El Ideal is a must-visit for me because it's considered as one of the oldest bakery in the country. It was established in the circa 1920's by the late Cesar Lacson-Locsin and up to now, the locals still patronize their products, especially their Guapple Pie. We wanted to catch The Ruins by sunset too, so after refreshing a bit and trying out the Guapple Pie, we headed back to North Terminal on to our next stop. Of course, a trip to Bacolod will not be complete without a trip to The Ruins. The last time we're here, we were toured by the now famous Roger, the tour guide. Now we got to hear the equally funny and entertaining Mars. After listening to the tour, it's time to relax, enjoy how the sun splash colors on The Ruins and take lots and lots of photos. But if you're too tired from taking photos, there's also a mini-golf and large chess pieces inside. We were met by a friend at the Ruins and brought us to this very happy place! I missed this on my last visit so I was very happy we're able to go here. Cansi is a beef soup between Bulalo and Sinigang. In Sharyn's Cansi, there's no vegetables or other extenders for the meal, just yummy bowl of beef bone marrow. I learned one thing when we got here. When you ask for Patis (Fish Sauce), they will give you Toyo or Soy Sauce. I still don't know how they call Fish Sauce in Bisaya. Note also that Sharyn's Cansi closes at 8PM. Look at the time below? We made it just in time! But we had to eat fast in consideration to the owners. Ugh, just looking at the Cansi photo makes me want to go back to Bacolod. The day would not be complete without a visit to Calea, Bacolod's famous cake shop. I'm no sweet tooth but Calea is really heaven. I love their cakes! Not too sweet but very flavorful. Yummm! This is just a quick run through of what we did on the first day of our Bacolod-Iloilo-Guimaras trip (now hashtagged #TheBIGTrip). I'll post details later but for now, here's our Day 1 itinerary. Bus Back to North Terminal 89 They're so tired, they didn't want to take a jeep or non-aircon bus anymore. But it's really just Php 15 to take the bus back to North Terminal. The Ruins Entrance 80 Note: We're picked up by a friend from Ruins so we didn't have to take a tricycle back outside the subdivision. But it should cos you another Php 40 to get back.